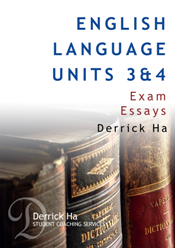 Derrick Ha’s English Language Exam Essay Guide teaches students how to effectively incorporate metalanguage and linguistic concepts into a succinct and articulate exam essay. This book is an indispensible tool for current VCE English Language students and provides a unique student’s insight into the requirements of essay writing for the VCE English Language Exam. The author of this book, Derrick Ha, completed English Language Units 3&4 with a study score of 50 and a VCE Premier’s Award in the subject. With this in mind, you can be confident that his essays reflect what is needed for your actual VCAA exam essay. As distinct from other essay guides, this book features essays and examples that are written by a successful student under exam conditions and specifically for the VCE English Language exam. All 16 essays written by Derrick during his exam preparation. Every aspect of the essays, including hand-written plans, crossed-out paragraphs and self-corrections. Commentaries and narrations that demonstrate the thought process involved in writing an English Language essay. Essays provided in chronological order to show the improvements that can be made with continual writing. An exclusive guide to structuring your essay writing, designed specifically for VCE English Language. A section on ‘Exam tips’ that provides practical advice on essay technique and exam preparation. Examples and arguments that can be tailored for your own use in the VCAA exam.